Download a Free Ebook sample of the CD. Fill in the fields below. This is NOT a new way to play golf. It is the physics of hitting down... explained. Do You Hit The Golf Ball Fat? Or just as often, thin? No matter how much you practice? The answer: "Hit Down Dammit!" Whether beginner or advanced, you will never reach your golf potential until you understand the principle and technique of hitting down at the golf ball. There's much more to learning this game than hitting it long and straight. In my extensive experience teaching golf I have come to see that most golfers have more than enough ability. Yet they still struggle. Typically their problem lies not with their talent level, but with the fact they are trying to do something wrong. In an overwhelming majority of cases they are trying to hit up at the golf ball - AND THAT IS WRONG! Get a sample by email ! Measure your swing speed with affordable Doppler radar!! Increase your swing speed to increase your distance. Receive a free copy of " How to hit the Longest Golf Ball Using New Golf Club Technology"
"You have created a Masterpiece!" Clive Scarff has been teaching for 10 years and through this period he has come to the realization that this is the area where most people struggle with the golf swing. The idea of hitting down at a golf ball sitting on the ground is foreign to many people, and this CD makes it very easy to understand. Whether it is a 5-iron over water or a 25 yard pitch shot, this CD will work for you. 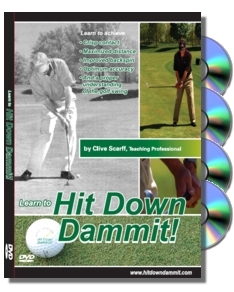 Clive has taught thousands of golf lessons, and his teaching methods, along with his passion for the game, come through loud and clear in "Hit Down Dammit!" I know it has worked for me. More often than not I find students are trying to get under the ball and lift it into the air - and that is not how a golf shot works. And the more they try, the more they fail. The "amount" of practice becomes inconsequential if what you are practicing is wrong. It then became obvious that clearly and thoroughly explaining the physics of the golf swing - a downward action - suddenly allowed students to do things they "wanted" to do before, but could never achieve. Actions such as a proper weight shift, releasing the golf club, and even chipping became simple when the action was married to a downward strike at the ball. "No one has ever told me that before!" This was even the reaction of students who had previously invested hundreds of dollars in golf lessons. And so, "Hit Down Dammit!" was born. While this is not a "how-to play golf" lesson, no beginner can afford to learn this game without the vital information included on this CD. And as for intermediate or advanced players, especially those who feel they have reached a plateau in the development of their golf game, "Hit Down Dammit" will show you how fully understanding the principle of the golf swing will remove any impediments to constant improvement. I am fortunate to have created "Hit Down Dammit!" at a time where technology allows us to go beyond traditional instructional books. By creating this vital lesson in the form of an interactive CD we are able to add video, sound, full-size photographs, as well as the ability to print out lessons and drills on one's own computer. For the cost of a single golf lesson this CD can teach you what it would take a season of golf lessons to accomplish. Not to mention you can take the lesson over and over again! At your leisure, on your timetable, at home, in the car, or at the range. If no one - instructor, friend, book or magazine - has explained to you the principle & technique of hitting down at the golf ball, you are missing critical information. Without this information you will always struggle.